The Merrill Gardens at Rolling Hills Estates has finally begun it’s shoring phase of construction. After a very long acquisition process that spanned nearly 5 years, it’s good to see this project kicking off! The project team is just completing the installation of the shoring system consisting of 68 shoring piles that will serve as part of the building foundation system and exterior foundation walls. Unique to this project are the shoring beams; they will support the exterior parking garage walls and will serve as a structural component providing lateral bracing and bearing support to the perimeter building walls and foundations. 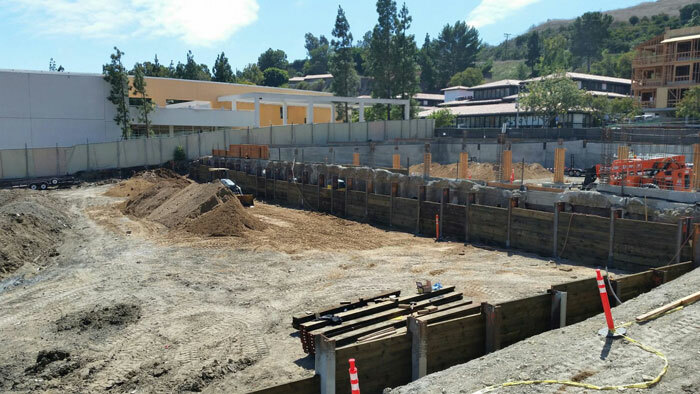 The installation of the shoring system will allow the completion of an adjacent parking structure that serves the neighboring Rolling Hills Estates Public Library, nearby office and retail buildings. The project construction drawings are currently in plan review and are expected to be released along with the building permit in late 2017 with the start of building construction to follow permit issuance in late 2017 or early 2018.